Long time no blogging. I know. Seriously a long time. And I can´t really blame life of getting in the way or something like that, as I´m ending my 2-months long summer holiday with no job, no – or very little studying and not really any good summer-weather either, “forcing” me outside… So there should have been plenty of opportunities to bake, cook and blog, but too much time makes me lazy… What can I say? The less I do, the less I….do. But now I´m back! Because I´ve really actually cooked and baked and eaten a lot of good food this summer, so I guess I ought to share some of it, and not keep it all to myself! The last weeks, when there was several days in a row without rain (yeah, I know) I packed my blueberry-picker and went hunting. (Appearantly the picker is a somewhat Norwegian, or maybe scandinavian? thing, because it really attracts tourists!) I´ve had heard that the blueberry season was started, and some friends had already been having good luck finding berries, so I was pretty optimistic. But I have to say I was a little disappointed. There weren´t as many as previous years, and besides, they were small, but I thought to myself that a cold summer with a slow ripening process would produce even better berries, as the case is for strawberries. It wasn´t until some old ladies came along and spotted me and my picker in the woods, who also noticed the small size of the berries and claimed that they weren´t sweet, that I actually took a berry-tasting-test. I thought they might have said it to scare me off and have the berries to themselves, but they were right. The blueberries weren´t really sweet. Bummer. But I finished the surrounding blueberry bushes and started to walk home. On my way I came to talk with another guy curious about the berry situation, who asked about ripeness, size and flavour. When I said that they were pretty small and also a little sour, he said “Well, then it´s almost a complete waste of time!” And I wondered, was it? Did I spend so many hours for nothing? I would prove him wrong! These blueberries maybe aren´t the best for snacking, but put into baked goods in companionship with sugar and butter, that would probably make up for it! I made some jam right away, which was lovely, but now, it´s time to do some baking, I figured! Today I invited a friend over for coffee and something home-baked, so I figured it was a nice opportunity to use some of the berries. 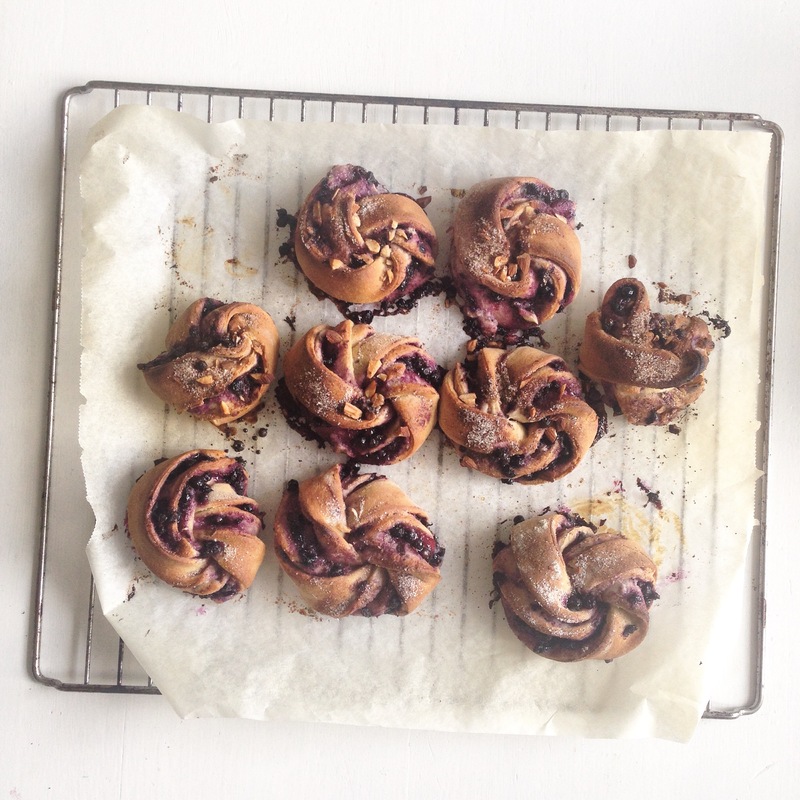 I finally made a decision on what to bake (my first intention was a blueberry bundt cake, eventually a pie – but as there was just the two of us, I figured it would be better with something in a serving size that also could be frozen) and landed on these blueberry rolls. I was a little short of time, so I tweaked my single-rising yeast recipe, and adapted it to a more suitable number of rolls. I substituted most of the wheat with whole wheat, and used fresh blueberries, butter, sugar and marcipan for the filling. They turned out delicious! A little burned, but still good! To make filling, combine all ingredients in a bowl, mashing the berries slightly. Spread the filling evenly over the surface of the dough. Perfect to break apart and eat it bit by bit, making room for a zip of black coffee in between the bites! I love to eat them like that, getting a feeling of all the different textures and flavors. 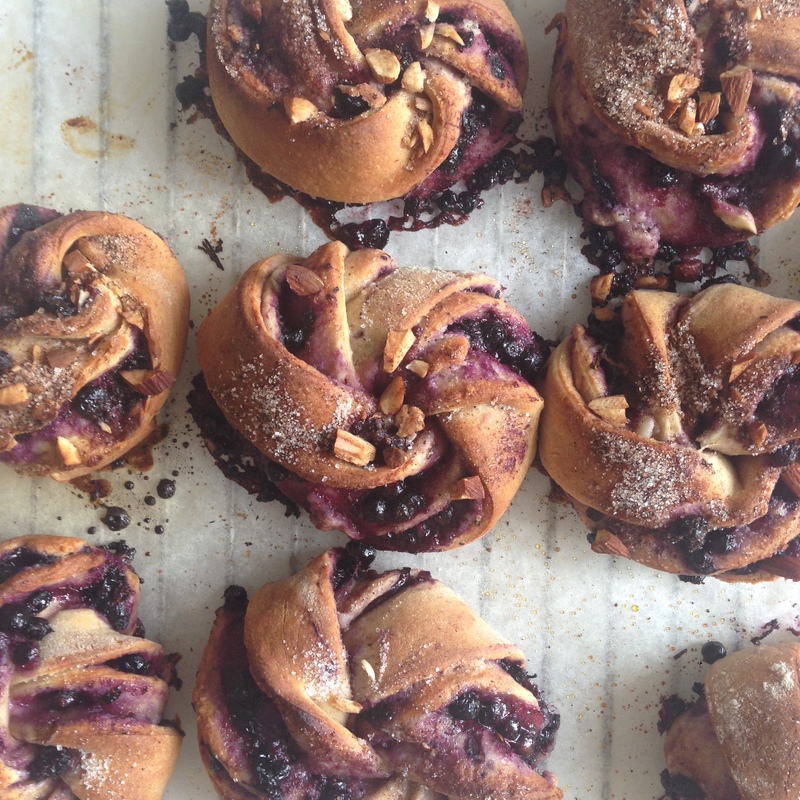 And the berries were perfect in these rolls! The buns turned out sweet and buttery, hearthy and filling because of the whole wheat, and the marcipan gave a lovely almondy flavour! I knew the berry picking wasn´t a waste!